A carnivorous French Onion soup? 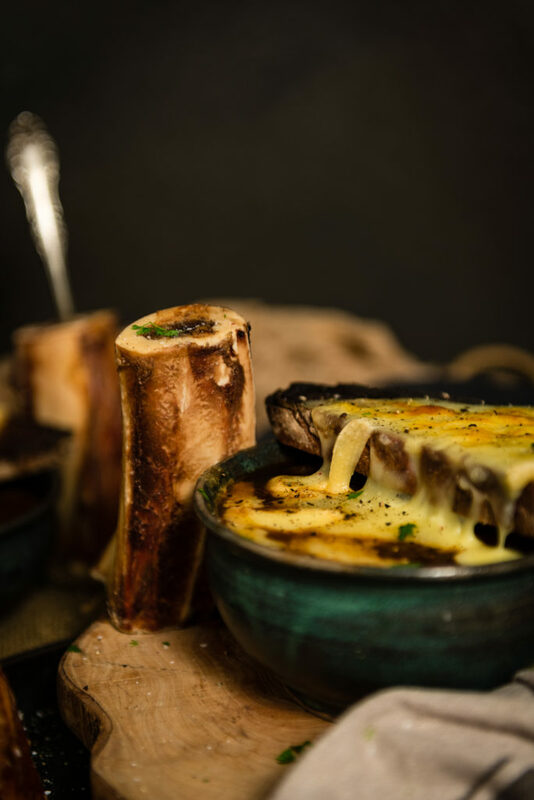 Hot roasted bone marrow spooned on top of melted cheese, all over a bowl of slow-simmered onions. Yeah, that’s what I’m talking about. French onion soup is about as classic as you can get in the world of soups. The base idea behind this soup has history all the way back to the Romans. However, it is one that I don’t see a lot of people coming back to often. I started to wonder why, as the idea of simmered onions in a flavorful beef broth sounds pretty comforting to me on chilly days. Perhaps its that people aren’t too fond of ‘onions’ these days. Or that we have more options out there than the early creators did. Either way, onions are often cheap and I wanted to see just how many people I could get raving about this recipe. (Turns out, quite a few). Before we even get to the recipe, we need to discuss that onions are not all the same. This recipe calls for 4 pounds of onions, and although I had a few pounds of yellow onions on hand, I also threw in 2 Vidalia onions just to sweeten things up. For the soup though, I wouldn’t use 4 pounds of sweet onions though. You want a good bold but not harsh or bitter flavor. For French Onion Soup that is classic yellow onions. They cook down beautiful and are the perfect base for this. Be sure to allow the onions to caramelize. This is part of the flavor building process. Sure, you can rush it and have soup faster, but the flavor from the slowly caramelized onions really is the foundation for this spectacular recipe. With a soup as simple as French Onion, splurge on quality ingredients. I used beef bone broth for this as the beef broth for this. I wanted a rich robust flavor and knew that it wouldn’t come from my standard (even though I love them) broths. We turned things up a notch by adding bone marrow. I knew I wanted to infuse the buttery bone marrow into this soup. I roasted it on the side and let people pic if they swirled it into the hot soup or spread it over slices of homemade bread. If you follow the directions for this recipe, you will make a LOT of soup. And, as much as the broth was amazing, even I had to admit to too many leftovers. To freeze, I pour cooled soup into resealable freezer bags. I try to portion them into 2 bowl servings. I make sure to label them before the soup goes in, with the name of the recipe and the date for better freezer organization. I lay them flat on a baking sheet and place in the freezer. Once frozen, in flat layers, they can be stored in the freezer for 3 to 6 months. Ready to keep warm with some killer soups this winter? Yeah Me too. Try these out! 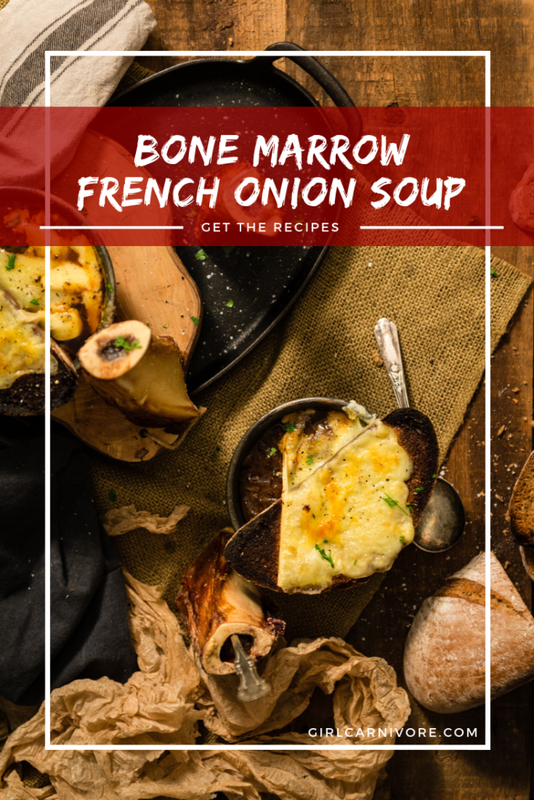 If you’ve tried my Bone Marrow French Onion Soup recipe, or any other recipe on GirlCarnivore.com please don’t forget to rate the recipe and let me know where you found it in the comments below. I get inspired by your feedback and comments! You can also FOLLOW ME on Instagram @girlcarnivore as well as on Twitter and Facebook. 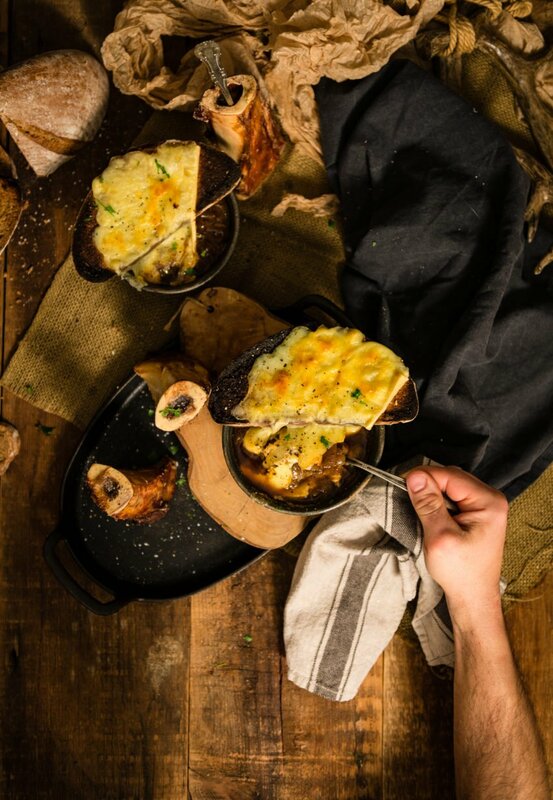 A carnivorous French Onion soup? 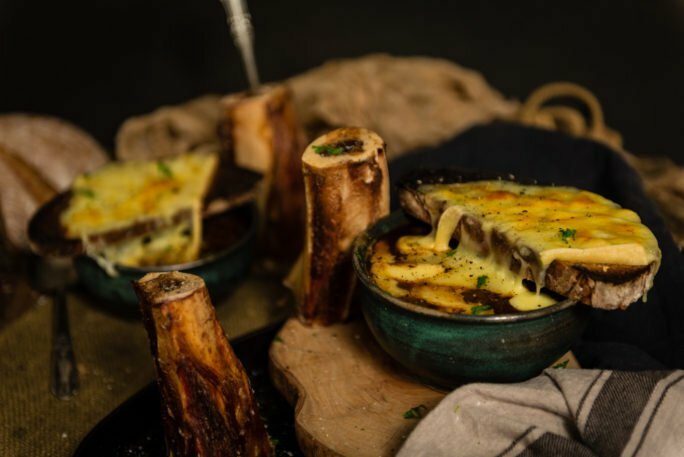 Hot roasted bone marrow spooned on top of melted cheese, all over a bowl of slow-simmered onions. This takes the classic favorite to a whole new level. Heat a 7 quart or larger dutch oven on low (seriously, you need a pot this big, it makes a ton!) and melt butter. Remove from heat and stir in onions and 1 tsp salt so that onions are coated. Transfer Dutch Oven to lower center rack in oven, and cook covered for 1 hour. Remove from oven and stir, scraping bottom and sides of pot. Return to oven for 90 minutes with lid slightly ajar. Stir and scrape again half way through. (Onions should be very soft and golden brown. Remove from oven and transfer to stovetop. On medium heat, cook onions until they brown and a crust forms on the bottom of the pan (about 30 minutes) stirring frequently and scraping the pan as you go. Stir in water, 1/4 cup at a time scraping free crust, until it evaporates and crust reforms on pan. Repeat 3-4 times until onions are very dark brown. Stir in chicken and beef broth, water, thyme, bay leaf and 1/2 tsp salt and bring to a simmer. Reduce heat to low and simmer 30-40 minutes. meanwhile, set oven to 425 and roast marrow bones 15 minutes, seasoned with salt and thyme. Remove marrow from oven and let cool. 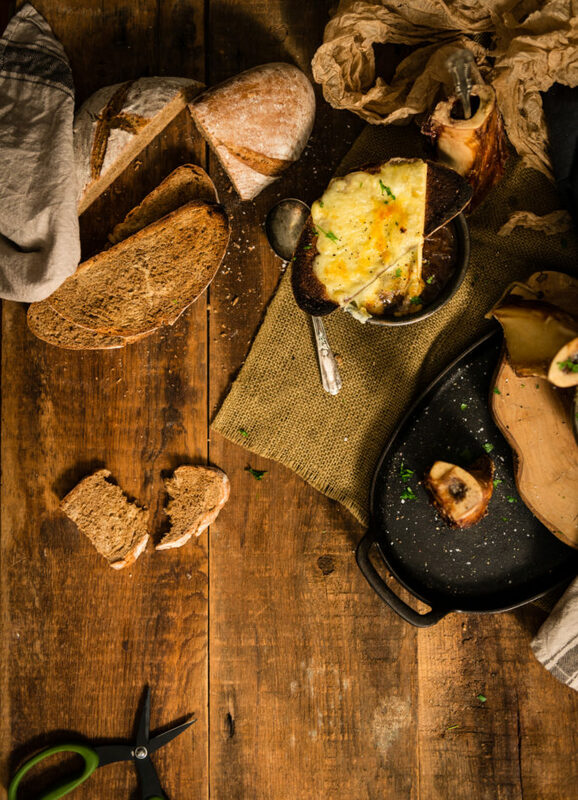 Place 8 oven safe bowls on a baking sheet, fill with soup and top each with a slice of bread and raclette. Switch oven to broil and with the top of the bowls 6-8" below broiler, broil until cheese is melted (approximately 5 minutes). Serve with bone marrow on the side. 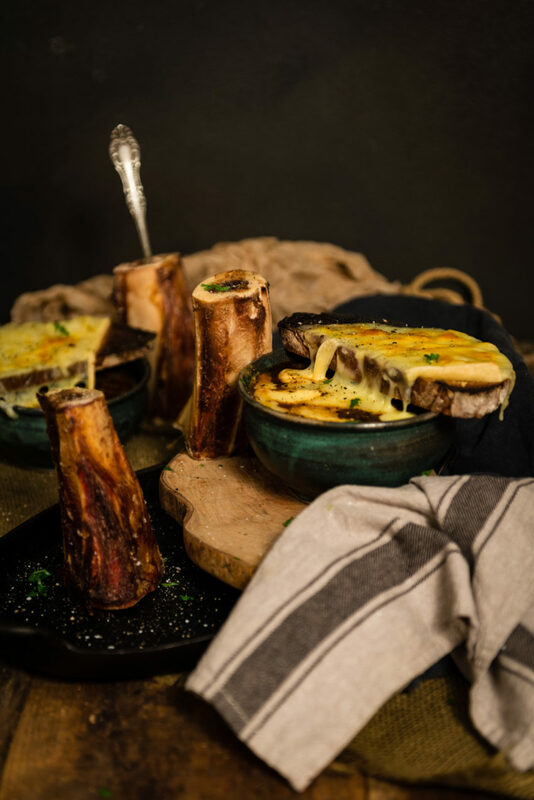 The marrow can be spooned on top of the bread, or mixed into the soup per individual preference (I think it is delicious on top of the bread) follow link for the full marrow recipe. The best stock comes from bones!